Once you have your story world and people in place (usually after the first act), you can start to layer your characters (and your plots and subplots, but that’s tomorrow). By Season Two, everybody knows how the Machine works, that it also works for the government, that the agency it works for is ruthless and doesn’t hesitate to kill anyone it thinks might be a threat to the Machine. At that point, it’s time to change things up. Things are going to get worse, yes, but they’re also going to get more complex. One of the many things PoI did during their second season to shake things up was introduce Samine Shaw, the female Reese and Root’s opposite number. Shaw would be a tough sell–she’s an emotionless, remorseless killer for the government–except that she’s also highly skilled and fiercely loyal. (And she’s played by Sarah Shahi, which is really all we need.) So what we have in Shaw is a very dense character in that she’s so many layers of dysfunction while being highly functional. In order to show that, PoI gives her The Day That Is Different, the day she realizes that the people she’s given her life to are trying to kill her. The writers also did something I don’t think you can do in a linear novel: They made her the point of view of character in the story. PoI is almost always told from the PoV of Finch and Reese, but this one is all Shaw. She’s the number of the week, but we don’t know that until ten minutes in when Reese shows up to save her and she shoots him. Instead, we get a character that’s swiftly introduced in action (the fastest, cleanest way to show character) and in interaction with another character important to her (the second fastest way to show character, through the eyes of someone else). She and her partner, Cole, clearly have a close working relationship, and that’s really all we need to know–she’s skilled, she’s fiercely loyal, and her closest relationship is with Cole–before the employer she’s loyal to rips Cole away from her. All she has left now is skill, and the rest of this episode is just that: action scenes that build her character in layers as she goes after the government, implacable and incredibly dangerous. Reese and Finch (and Carter and Fusco and Leon and Bear!) show up, but only as supporting characters, conservationists trying to save a wild animal, and when Shaw drives away at the end and leaves them stranded, we can only hope that she shows up again. (Yay, she does!). • Using the Machine view in the titles to switch to the Machine in government mode, interrupting Finch and showing the PoV switch. • The first scene with Shaw getting coffee and telling the terrorists she doesn’t speak German, just a nice girl in trouble, then taking out the bad guys. It’s a character reversal that first invests us in her nice-person charade and then shows us she’s so much more. And it’s fast. • Taking a significant chunk of the opening to show Shaw and Cole in action together, even though what they do will not have an impact on the rest of the episode. What does have an impact: their relationship and their skill-set. They work as one person, so when Shaw loses Cole, she loses a part of herself. • Shaw’s attention to detail, and her nerveless response to danger, again shown in action. Action is character. • Cole saying, “Control called, we got another number,” which sets Shaw and Cole up as the government’s Reese and Finch in six words. • Cole and Shaw’s argument over where Research gets its numbers. Shaw’s “Research is never wrong” shows her intense loyalty and also sets her up for the fall. It’s a brilliant moment of brief dialogue that reinforces who she is. • The whole “I’m going to stitch myself up with the help of drug dealers” sequence, especially the part where Shaw gives her backstory in about three sentences while she’s dressing her own wound and then while she’s facing down the other drug dealer. This is a great way to give character history while also showing that Shaw is implacable. • The soft-spoken government guys hunting Shaw; they’re murderous and evil, but they admire her skill. When the bad guys admire you, the viewer/reader knows you’re good. • The calm way Shaw talks to the Special Counsel, underscoring how powerful they both are and how controlled they both are. • Finch letting Hersh kill Shaw before they brought her back so that the government thinks she’s dead. I know that’s not character, but it’s such a great story move, it needs a shout out along with the freaking pacing in this thing; even the quiet moments are tense. • “No, just yours.” Cole was great. • The brief scene of Root as Control’s secretary. • Shaw on the couch, drinking a beer next to the guy she just killed. • The first shot of Root as Veronica, pulling the story back to the Machine Gang and frenemies. • “I kind of enjoy this sort of thing.” “I am so glad you said that. I do, too.” The start of Shoot. • “A good soldier does both.” Great moment of revenge. • Fusco and Carter on the scene. • Leon bitching because Shaw tried to kill him. • The music: “The Future Starts Slow” by the Kills, over the final scenes. Basically, everything in this episode. It’s flawless. This explains so much of why I connect faster with some shows or books over others. When the characters are doing things they are more visible than when they are reacting. Interestingly, this goes for real life too. It is much better to know what to do and then do it yourself, rather than reacting to situations. Favorite bits: everything with the drug dealers! Dealer: You weigh what? 100 pounds? Sameen: 9 mm round weighs about a quarter of an ounce. It gets the job done. Dealer: But your gun’s a .45, little girl. Sameen: I was talking about my backup piece. I’m not sure whether it’s technically a reversal? But it sure feels like one. It reminds me of that scene with Bear, when Reese tells the bad guy what type of dog he is and that his barking means that he doesn’t respect the bad guy. The thing that bugged me about that was that Shaw was no dummy. She’d have shot him first and then said, “I was talking about my back-up piece.” Why give him the chance to be quick on the trigger? The government characters in this show are so unique. They do some of the cliche spy boss things like betraying their own agents, but the deceptive simplicity of their devotion to the program isn’t something you see in their types of characters often. Special Counsel and Hersh both find Shaw’s multi-tasking actions to be the proper thing. They’re so blase about her killing Wilson. They see no contradiction in still killing her. Special Counsel will have little issue with his own death, due to his failures. Control will keep acting as if Shaw is still one of her agents, even as she prepares to have Shaw killed, or berating Grice for letting her go. Even the most leftist fans of the show cheer when she gives her pro-surveillance state speeches to Vigilance and Senators alike. Somehow, government figures standing by their ideals to the end is novelty, next to predictable politically-motivated shifts. I just saw them all as terrifying until the very late episode where Reese, Finch, and Shaw are with X and realize the only way to stop him is to kill him. And they don’t, they don’t cross that line, but because they don’t the entire country might be lost. (Hoping we’ll know by the end of Season Five.) That was the first time I actually thought, “Kill him,” and realized I was no better than Control, who had been doing the same thing all along to keep the country safe. “I actually thought, ‘kill him’…” But that this show makes you check your own thoughts and grasp at your morality is another great thing about it. Highly intelligent people with very unique skill sets and they do keep themselves in check… Most of the time. 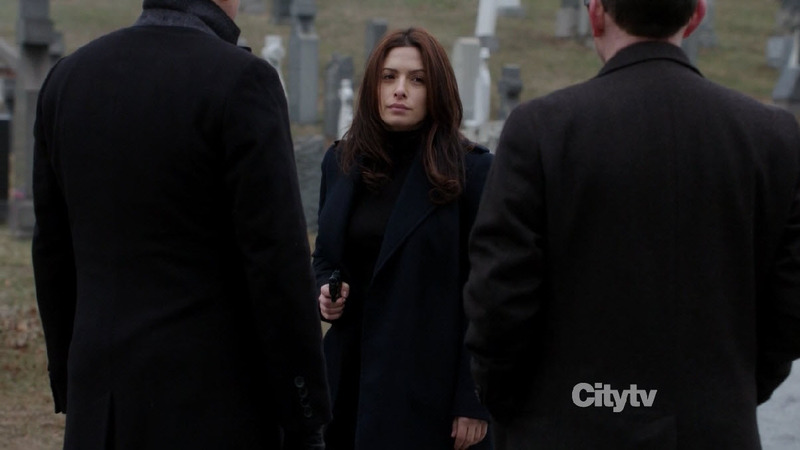 When I watch Shaw, I wonder what it would be like to go through life with such a lack of emotion. Lonely, sure. But when I think of everything I could accomplish. This is way too deep for PoI. The thing is, the thought makes you into Control, even though you hate her for deafening Root. It’s what she would do. So a story that began in black and white with the pilot becomes so layered in grays that you have to think while you watch it. By the end, Elias is still a mob boss, but you root for him. It’s challenging in such a good way. You’re right, of course. I caught myself again questioning my ethics in a season 3 episode when Elias’ planned and executed retribution on someone for something that person had done to the protagonists. Wow, did I ever root for him. I’m talking shouting encouragement through sobs support for him. Elias is a villain, but I absolutely rooted for him in those awful moments. Yep. I was with him completely and watched with him while somebody was strangled. One of the greatest moments in the entire series because I wanted it SO BADLY. Second only to Fusco refusing to do it, which made me weep. Great, great episode with phenomenal writing and performances. And really, that’s why Fusco is such a key character to the series. As the stakes get higher and higher and the scope gets ever more international, Fusco keeps the show grounded, reminding both the protagonists and the audience of how these power games being played still involve real people. The events of the AI plot keep demanding more and more inhumanity from our assassins, but first Carter, and then Fusco, show that there’s a better way. Jesus I’m behind. Also, I need to not read comments. All I wanted to share was, OMG the pacing! The show ended and I couldn’t believe it cause it didn’t feel like 40 minutes. I was hooked the whole time. Anyone ever seen (I think it was) Dressed to Kill? Eddie Izzard? When he’s comparing British movies v. American moves and for the American movie, it’s so much action, you’re glued to the screen, throwing popcorn at your face, you’re so pumped? That’s what it felt like.